FlexFix Integrated Bike Rack | OhGizmo! For those who love to bike ride but prefer to do it outside of the city there’s now an extremely convenient way to transport your bicycles, that is if you’re willing to buy a new car. A few months ago Opel made the FlexFix integrated bike rack available on their Corsa model. 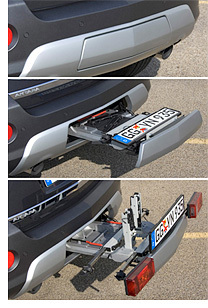 The collapsible rack can be pulled out from the vehicle’s bumper like a drawer and then unfolded to provide the necessary mounting brackets to carry two bikes. When not needed the rack is easily stowed away where it’s barely visible. It even has an extra pop-up license plate since the one on the back of your car won’t be visible while carrying bikes. At the moment the FlexFix system is only available from Opel but it seems GM Europe has recently announced it will soon be available on the new Opel Antara crossover vehicle. And since the Opel Antara is basically the same vehicle as the North American 2008 Saturn Vue many are hoping GM will bring the option to the US and Canada as well. ← PLUG-IN – Why Weren’t They Designed Like This In The First Place? Shouldn’t the licence plate show all the time…? It does, photophile – there’s already a license plate on the back of the vehicle – it’s not visible in these pictures though, it’s a bit higher up. If you had a bike on the rack, however, it would obstruct the ‘primary’ license plate, which is why there is a second plate, identical to the primary plate. Ah, now I see it. There’s a corner of it in the third photo.